The Manipur State Journalists Award was conferred to eight media persons including an editor of a vernacular daily in eight different categories. The award which carries a citation, scarf and a cash award of Rs 25,000 each were presented during the National Press Day celebrations at the banquet hall of 1stbattalion Manipur Rifles in Imphal on Friday. 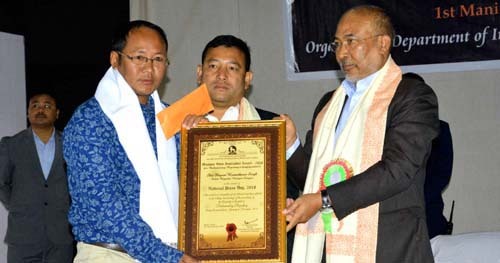 The award was sponsored by Directorate of Information and Public Relations (IPR), Government of Manipur. The award winning media persons are Ratneshowri Goswami (Sports Reporting), Bijoy Laishram(Public Health & Hygiene), Puyam Romeshwar (Parliamentary Reporting) Ashem Babycha ( Women & Children), Naorem Gyanand(Art & Culture)-all from Hueiyen Lampao daily Kshetri Meghajit ( Science & Technology) of Naharolgi Thoudang daily, Sagolsem Bigyan(Rural Reporting) and Editor Aribam Robindro Sharma(National Integration & Communal Harmony) both from Poknaphamdaily. Manipur Chief Minister N Biren Singh along with consumers’ affairs food and public distribution minister Karam Shyam and Director Heisnam Balkrishna of IPR attended the ceremony. Speaking on the occasion Chief Minister Biren reminded the gathering that during his journalistic career he had received the Best Journalist Award in National Integration and Communal Harmony. He said media persons must be supported and encouraged as the profession is risky, dangerous and full of uncertainty. With the coming of the new government there has been a positive change. Praising state’s media for doing good work in a mature way, he said the public should be aware about restrictions and censorship in every aspect including social media. In his speech, Revenue Minister Karam Shyam appealed to the media fraternity to be neutral, un-biased and fair while reporting news. A workshop on ‘Journalism Ethics and Challenges in Digital Era’ was organized with Editor Pradip Phanjoubam of Imphal Free Press as the moderator. Joint Director IPR W Phajatombi Devi, officers & staff of DIPR, eminent media persons and students of State Institute of Journalism and Mass Communication, Manipur University attended the function.